RIT student Ashley Bonney, left, and Professor Doug Merrill work with Jalynn Web. An important goal of RIT’s partnership with Uncommon Schools’ Rochester Prep High School is to help the students there envision their college future and build toward success. Targeting that goal is a new program that engages several of the high school’s first class of seniors to work on research projects with RIT faculty and students. From September to December, seven Rochester Prep students met with RIT faculty to work on capstone projects varying from photojournalism to microbiology to game design and development. RIT has been a strategic partner since the charter high school’s inception in 2014, with the goal of increasing the number of city high school students who enroll in and succeed at college. Rochester Prep will graduate its first class in June. RIT students have served as tutors and mentors for Rochester Prep students. Faculty developed design courses. Staff coached Rochester Prep students on admissions interview techniques, and Rochester Prep students have visited the Henrietta campus frequently to explore the range of majors. The capstone projects provide students hands-on, advanced-level work in fields they would not be able to experience in their high school. 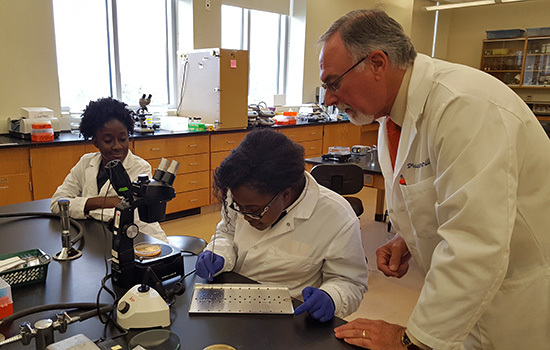 “Students come from high school with a whole variety of interests and I don’t know if there’s an interest you can have that RIT doesn’t cover somehow in its programs,” said Doug Merrill, professor and director of RIT’s Center for Bioscience Education and Technology. With guidance from Merrill, Rochester Prep senior Jalynn Webb designed and developed an experiment to examine antibiotic resistance of bacteria found on fruit sold in supermarkets. Under the tutelage of Chris Homan, associate professor of computer science, Rochester Prep seniors Ayesha Lee and Keaton Hall worked alongside a group of graduate students to code computer games. Studying photojournalism under Assistant Professor Josh Meltzer, Rochester Prep seniors Justice Marbury and Ismael Cortez Jr. interviewed Rochester Mayor Lovely Warren and other community members for a video they are producing to explore the future of Parcel 5, a key piece of open downtown real estate. 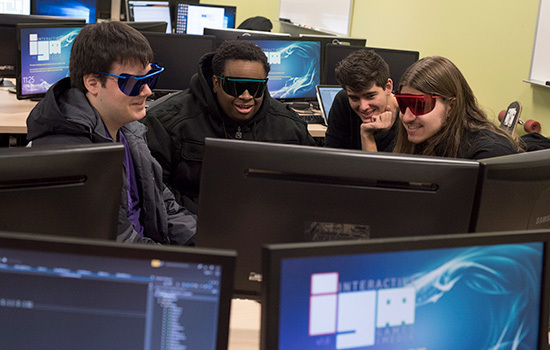 Working with Assistant Professor Ian Schreiber, Rochester Prep students Marble and Zaid Abdulsalam collaborated with RIT students to design and develop an experimental computer game that uses colored visors to distort what players see. The capstone projects have been an encouraging and transformative experience for the students involved. The RIT faculty and students involved in the program seem to be getting just as much out of the program. Ashley Bonney, a fourth-year biomedical sciences student from Prince George’s County, Md., who helped mentor Webb through her microbio­logical experiment, found it to be a learning experience. Hendler says Rochester Prep hopes to expand the program next year. Both RIT and Rochester Prep officials hope the program’s reach can extend beyond those two schools and serve as a model for other schools in the region and beyond.